On track with another finish! HomeUncategorizedOn track with another finish! I started the week ill and today I was off work. So whilst I was on the sofa watching a film, trying not to move too much because I felt so weak and my brain was doing funny things, I stitched the skinny binding onto my Rain Deer Limbo quilt. Ta da! You may remember that this was called Rain Deer Limbo because I made it in the inbetween Christmas and New Year “Chrimbo limbo” period when it didn’t stop raining, well that’s when I pieced it and started to quilt it anyway. I finished the rest of the quilting this weekend and now that’s one more thing off my WIP list. 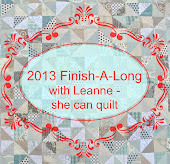 Which means I have completed my 3 makes for the FAL first quarter (all three are quilts!) and actually achieved something for the Lovely Year of Finishes as I finished it within March. 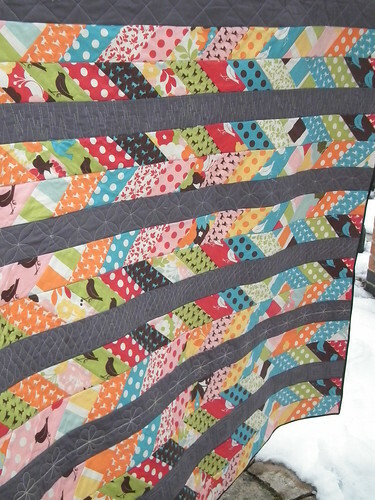 It’s also another UFO zapped for the Popular Patchwork WIP challenge. To top it off I can also enter it in Ange’s Monthly Book Challenge (though I have the book and don’t want to win, I just want to be supportive- please take note Ange!) as this pattern is from Jelly Roll Dreams compiled by Pam and Nicky Lintott but it is also in Love Quilting and Patchwork magazine if you were lucky enough to get a copy. 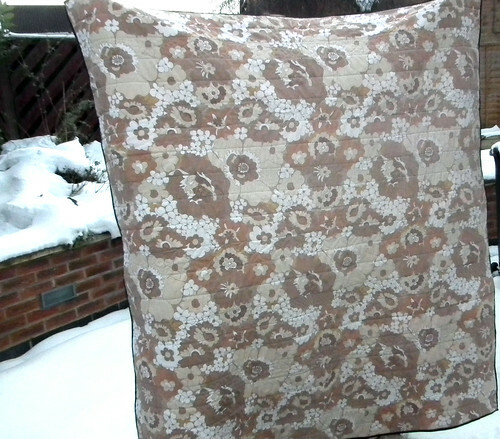 The fabric on the front is an Oh Deer jelly roll, the back fabric is my usual trick of upcycling old vintage bedsheets, I had enough for two quilts from this fabric found at an antique shop for £5. 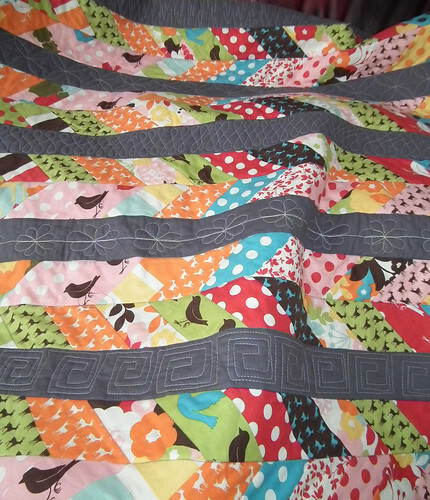 And I know it doesn’t match the front but I like my quilts to have a split personality (and avoid piecing where I can)! The quilting is straight lines across in teal but then with a variegated Aurifil thread, I tried 7 different filler patterns, most of which are from Leah Day’s blog. I actually am enjoying the quilting part more and more, I just need a foot with better visibility and a teflon sheet (or an extension table) wouldn’t go amiss to make life easier, especially when you’re weak because you’re coming down with the lurgy of a Sunday evening. The finished size differs slightly as I left the last row off (and I can’t remember why, but I could make a matching cushion with it), the original size is 57″ x 57″, mine is in the wash right now crinkling up and destroying my bad germs so I’m not sure. Previous post OMG!!! a.k.a. please vote for me! it’s lush! 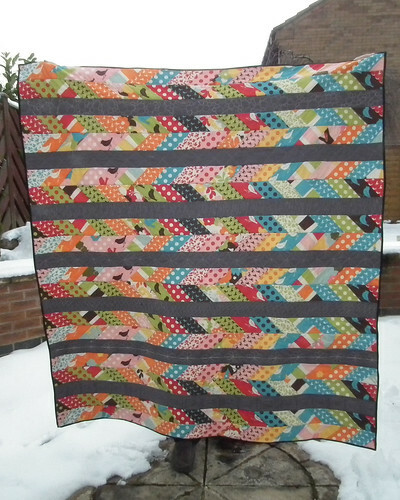 Well done with the quilting, it’s gorgeous and makes you look like a total pro. Pro quilter, not pro as in prostitute. Just wanted to make that clear. That is really amazing – another great finish! that looks great. Love the quilting and even if the back doesn’t match the front, I think it works really well. Congrats on the finish! It is a wonderful finish, I really like your quilting. I hope you feel better soon, and that you get that new project started. I love the quilting you went with. Looks fab! Great finish. 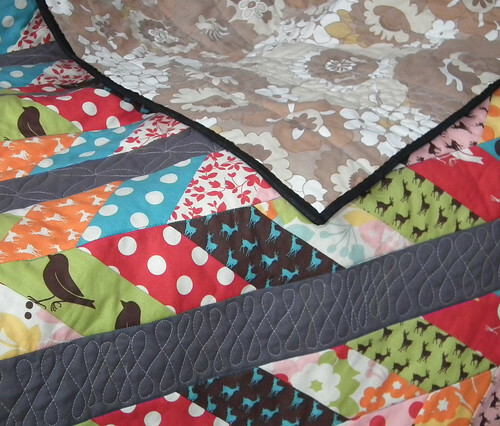 This quilt is lovely, as are your other finishes for the FAL!